As an experienced party band we can provide the required blend of music and entertainment for your Bar Mitzvah or Bat Mitzvah party. We are competent in performing a large selection of traditional Israeli music for dancing and can provide written testaments from previous clients confirming that we are well-versed in the formalities of Jewish events. We will provide a fun and exciting evening with songs to keep the younger generation entertained, whilst maintaining the balance so that you, your family and your friends can enjoy themselves too. 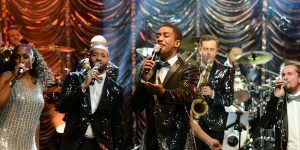 Our versatility enables us to perform not only Jewish music but songs from the 1950’s right through to today’s chart hits, liasing closely with you from booking up to the event in order to ensure that we provide you with an appropriate combination of live music and entertainment that you and your guests will really enjoy. Our extensive playlist includes our main playlist plus a selection of Israeli music suitable for your event. If you are looking for professional entertainment for your Barmitzvah party, contact us today. We are happy to answer any questions and confirm available dates. Klezmer, Swing, Israeli and traditional Jewish music Trio. The band can play as either a solo, duo or trio and are ideal for the reception drinks and even through dinner.